For example, when operating a payment system of a Bitcoin at EC site (site for selling and buying goods on the net), the server of EC site does not access the private key for safety, and It is necessary to generate payment address for settlement. But, in the case of Bitcoin core wallet, 100 keys are cached in the pool of reserved keys by default, so this wallet can not be operated simultaneously in multiple systems. Also Bitcoin core can use the encryption function to protect the secret key in a way that does not share the password, but can not generate the public key. HD wallet is a method of generating a private key from one seed (random number) and managing it using a hierarchical structure. Back up the seed only once, it can restore the key and it will be easier to manage. It can safely generate the public key without exposing the private key, generate a payment address for each remittance, and manage those balances as well. In HD Wallet, it change Bitcoin address every receive / sending, it is the basic design, protecting security or privacy at the same time while maintaining the convenience of backpack. →Behind bin data add checksum generate to Master private key. →Convert hex to byte data of 256-hex,It contains the following information. Generate process of address is exactly the same previous method. As noteworthy,the key data Included in Master public key is not start from 46-byte but 45-byte. ※The code is used in this article,it have posted on GitHub. 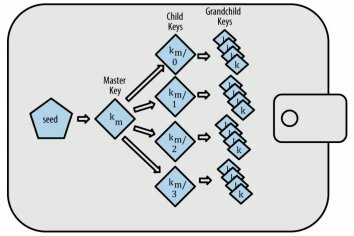 Deterministic Wallets created child key from parent key using "Child key derivation (CKD)" functions. Hierarchical Deterministic Wallets have very useful characteristics that can generate child public key from a parent public key without using a private key. 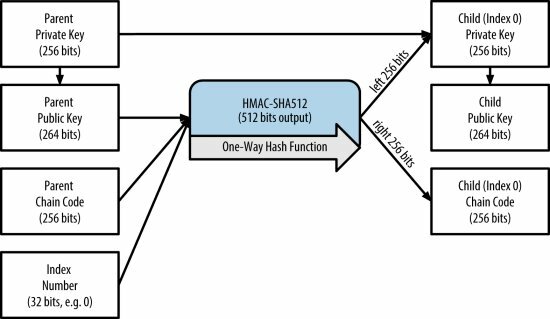 Add suffix(first 4byte) of double hashed bindata to bindata,it encode by chack58encode. Hardened derivation pubkey is generated child chain code using parent privkey instead of parent pubkey,destroy relationship between pubkey and child chain code. Nomal derivation fanction use index for 2 to 2^32-1(0x80000000 to 0xFFFFFFFF),Hardened derivation function use 0 to 2^31 -1(0x0 to 0x7FFFFFFF). Method of generating branch of pubkey from extended pubkey has potential　risk. Because extended pubkey is included in chain code,if single child privkey leak out become all child privkey leak out. It possible to generate child privkey and child pubkey. Expanded privkey can create complete branch root. It possible to generate child pubkey. Expand privkey can create branch of pubkey only. 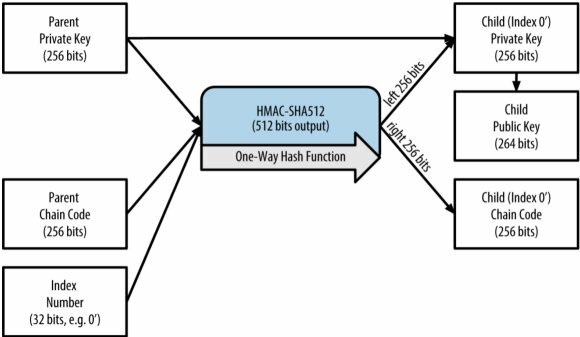 The key of HD wallet is determined uniquely using "pass". Tree hierarchies are separated by slashes.
" ' " indicates that hardened derivation is used.
" m " shows that is generated private key from master privkey.
" M " is generated public key from master public key. however data move to other wallet, takes an enormous amount of time. Two BIP0043 and BIP0044 proposing for this problem solution. BIP0043 proposed the first level of BIP32 tree structure to be used as "purpose". By extending this BIP, BIP 0044 defines the number "44 '" representing t "purpose" based on BIP 0043. The ｆirst layer is " m / 44 ' / " and "44” show number of purpose. It means that wallet adapt construction of BIP0044. BIP0044 aim to improve Wallet's compatibility by unifying rules. address_index：It is generated from HD wallet as child of charge.